As you saw from my last post, Tech Conference is happening next week. That is a great opportunity to mingle with other partners and developers, potentially finding that ideal place of work you have always dreamed of. In that context, consider participating in the Microsoft Dynamics salary survey carried out each year by Nigel Frank. I always enjoy reading through and comparing all the numbers and just the general stats are pretty fun. Here's a more detailed description of the survey from the organizer. Note some nice Microsoft branded prizes for 3 random participants. It's free to participate, and the chance to win is pretty good, considering the number of Dynamics specialists out there. Go for it! 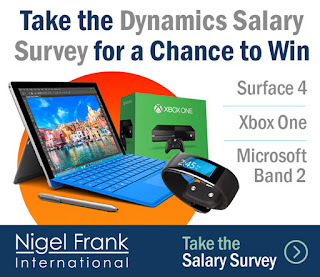 Take part in Nigel Frank’s industry acclaimed annual Microsoft Dynamics Salary Survey in its 7th edition and find out how your remuneration compares to others in similar roles. You will automatically be entered into a prize draw to win a Microsoft Surface Pro 4, Xbox One or Microsoft Band 2. I hear there are at least 1300 participants coming this year, and we have a wide variety of sessions planned. An instructor led lab on building workspaces, a new concept in the latest version of Dynamics AX. This comes in two parts, 1 hour long each, and as a result you will have built a fully functional workspace with Tiles, Lists and Charts. An instructor led lab on integrating with the OData endpoint exposed by Dynamics AX with the help of the Data Entities. This is the future of many integration scenarios for AX, so don't miss your chance to learn how it's done. A breakout session talking about a highly discussed topic of what kind of skillset is required for AX developers with the move to the latest AX version. A breakout session talking about Warehouse management functionality in AX, more specifically, installing, configuring and using the Warehouse Mobile Devices Portal with the cloud release of Dynamics AX. Over the last couple of months we have had a number of customers go live on the latest version of Microsoft Dynamics AX, and some of them have decided to use the Advanced Warehousing solution including the Warehouse Mobile Devices Portal (WMDP) that is shipped together with AX. Here I would like to focus on a few aspects we've learnt based on interaction with the Go-Live customers, that will hopefully help some of you to avoid the same problems. In the final (RTW) release of Microsoft Dynamics AX the assembly is strongly signed. If you want to learn a bit more (or get a ready PowerShell function for the above), refer to this blog post. WMDP is an ASP.NET MVC based web site and has a number of important configuration options in its web.config file. You can read more about the configuration options on MSDN. One particular setting is important to note, since it is believed that it has an "incorrect" value by default after installation in AX 2012 CU8 build. In production environments, this setting should always be set to "On", as WMDP X++ code in some cases throws unhandled exceptions, which result in a complete meltdown of the web site, if not redirected correctly to a user-friendly error page. The "Off" setting can be used on test environments when debugging the site, as it will provide call stack information for what happened.